Ah, how something like the following takes us geezers back to the old days! 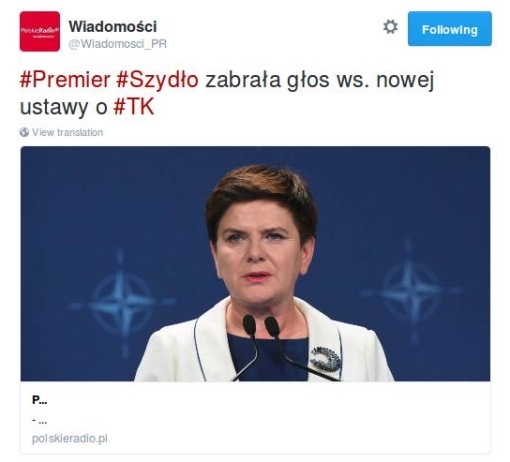 “[Poland’s] Premier Szydło discusses new law about TK.” TK means Tribunał Konstytucyjny or “Constitutional Tribunal,” meaning Poland’s Supreme Court. That TK hasn’t been operating so well lately, really since the new right-wing PiS government took power last November. Among other things, it then pushed through laws intended to severely curtail the TK’s ability to exercise judicial review, that is, to vet the laws passed by the country’s bicameral legislature (Sejm/Senat) and reject those in conflict with the national constitution. Those controversial government measures against the TK included rejection of judges who had been appointed to join the TK prior to the regime-change, in favor of other judges more to the new government’s liking. In exchange, the sitting TK has ruled against and therefore refused to accept those laws, and those new justices. For months now there has been this stalemate between the executive/legislative branches and the judicial branch – something along the same line but still much worse than the US Senate’s refusal to consider President Obama’s nominated replacement for deceased Supreme Court judge Antonin Scalia. The new government also legislated to put the national TV and radio stations under much closer government control, which led to mass resignations of much of the media talent at those institutions. These two areas – that is, TK and media – are the main elements (but not the only ones) which has led to much alarm about the direction of Polish democracy, foremost on the part of the EU, but also within the US government. A recent Washington Post piece in connection with President Obama’s visit to Warsaw for the NATO summit there (Obama slammed Polish democracy) showed this high level of concern. More entertainingly, it also lays out how tricky editing when it came to the report about Obama’s remarks that was actually broadcast on Polish State TV made sure that most national viewers were left with no inkling that the US President saw Poland as anything other than a model democratic state. Really, those who ran the same broadcast facilities with an iron fist during the bad-old Communist times – however many are still left – are surely nodding in approval. That WaPo peace is of course in English; you can read all about the details if you like. The point is, it’s now 2016 and media has expanded into the social variety, yet the same whitewashing treatment can be seen with those new sorts of messages, such as the tweet seen above. “Prime Minister discusses law” – as if the whole matter simply revolved about finding and passing the right legislation to clear up the TK controversy and get the government back to functioning normally again. For the details about this latest legislation the Warsaw Business Journal has a nice summary. 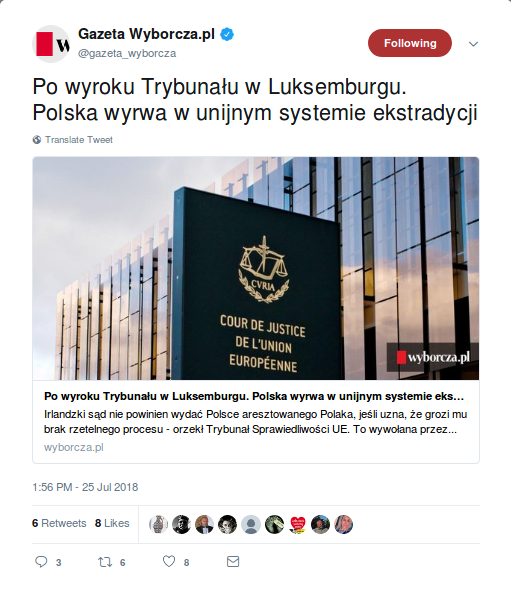 Ultimately, though, all of that is irrelevant: this is a constitutional stand-off that cannot be resolved simply by passing more laws, for it is clear that the Constitutional Tribunal will simply yet again point out how it is inconsistent with Poland’s constitution and reject it – and the stalemate will go on. The WBJ piece suggests that one function of this latest law was simply to try to impress on President Obama, in time for his visit, that steps were being taken to resolve this grave constitutional dispute – to fool President Obama, that is, since as we have seen this is no sort of effective contribution towards bringing about resolution. 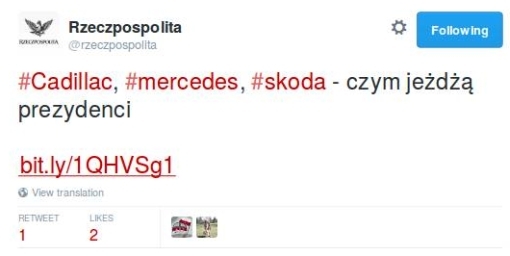 Of course, it’s unlikely that Obama follows the @Wiadomosci_PR (that is, “News_PR” when PR = Polish Radio) Twitter-feed: it is native Poles who do that, and so it is they who are being hoodwinked by such State propaganda, which, again, really must at least inspire nostalgia – of the unwelcome sort – among those old enough to remember government messages from the old RPL – Polish People’s Republic. Oh, to have one’s choice of a ride – of wheels, man, of an automobile to take you around! The vast majority of us are limited in this respect by budgetary considerations, but some are not. Among those are heads of state, and Rzeczpospolita takes a look at their choices of roadster. This inquiry just doesn’t come out of the blue, though. Last Friday there was apparently some sort of incident involving Polish President Andrzej Duda as he was riding in his official limousine along the national A4 highway. 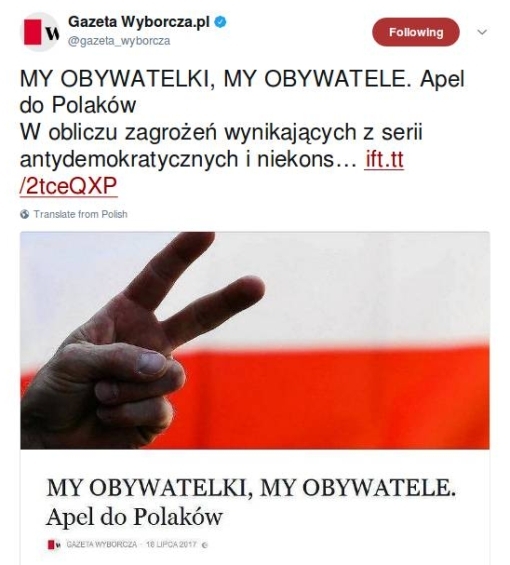 This article only mentions this in passing; you have to go elsewhere to find out any more about it (like here, to the tvn24 site, in Polish), and even then many details are still missing. The important thing, of course, is that President Duda was completely unharmed. Additionally, there seems to have been some damage to the tires, at least, but otherwise the incident is being investigated further, by all sorts of Polish governmental agencies. President Duda was himself asked directly about it yesterday (Monday), but he was willing only to confirm that he was in fine shape. Well, what sort of car is it that he rides around in? A common thread for presidential cars – as one would expect – is that they are made within the same country in question, so that, for example, David Cameron uses a Bentley Mulsanne, President Mattarella of Italy cruises in a Lancia Thesis, Czech President Zeman disposes of a Škoda Superb and (of course) Angela Merkel* has a Mercedes S Class. Poland is not really known for any make of cars, though, so President Duda is taken around in a BMW 7, the “High Security” version which is (like all the others mentioned) modified to reflect the needs of security (and of communications) for a head of state. President Obama’s ride is most famous of all. It’s a Cadillac, again highly, highly modified (e.g. to enable communication at any time with the Vice President and the Pentagon; also to withstand chemical attack), known as Cadillac One, or the Beast. This vehicle is transported to any of the various places in the world to which the President may travel, and is so heavily weighed-down by its armor and other equipment (it weighs 10 tons, although with a super-charged engine that can handle all that) that it gets only 100 km per 30 liters of gasoline (that is 7.8 miles/gallon). Vatican: Kia Santa Fe (! ); maybe they particularly like the model-name? * Yes, it’s true that, properly speaking, Angela Merkel does not belong in this list because she is a Head of Government, not Head of State. 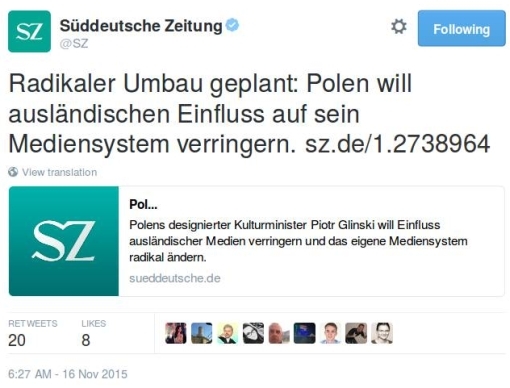 Nonetheless, this is the data-point which the (unnamed) Rzeczpospolita author uses. I think we can assume German President Joachim Gauck rides around in his own presidential Mercedes S Class as well. 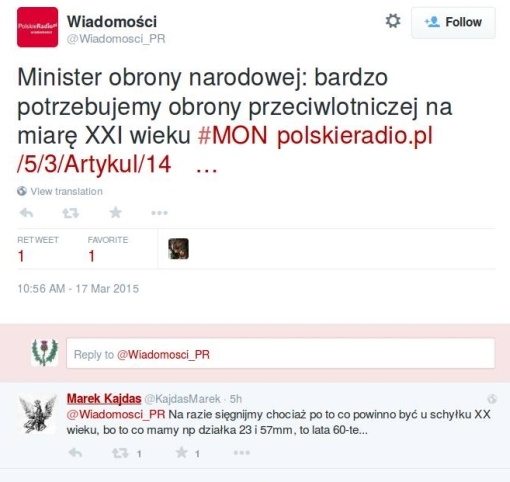 As MON [= Ministry of Defense] Chief Tomasz Siemoniak said on Radio 3, it has not yet been decided that American Patriot rockets will be chosen for Polish air defense. Now, it happens that some Patriots are due in Poland quite soon, at the end of March, but they don’t belong to Poland, they are American and will be there in connection with an ongoing series of military exercises with American forces that are clearly an explicit response to all the trouble happening on the other side of Poland’s eastern border. And that is just it: especially given that strategic context, why are people hearing statements like the following? We really need anti-aircraft defense for the twenty-first century, that’s been a priority for the last three years. It’s not only about the purchase of specific equipment, it’s also a matter of deep cooperation with other governments. You have to look at it as the complex affair it is. Right, and against the American offer to sell Patriots, the Polish Ministry of Defense is also considering what he called in the interview the French SAMP/T air defense system, which would seem to be from out of the larger “Aster” family of military missiles developed jointly by France and Italy. That decision is due at the end of May. But to me, the whole tone of Siemoniak’s report here is that of wanting to excuse delay and inaction. I guess what disturbs me the most about this news is the seeming lackadaisical attitude here in the face of a very real threat from the East, to which most Polish political actors, at least, have been quick to respond. But their efforts will have been in vain if/when the Russian air force gains air superiority over Polish territory through sneak-attack – and the nearest American air bases are far back in Western Germany! “Hungary stops gas deliveries to Ukraine.” Would that have something to do with the visit by Gazprom chief Alexei Miller to Budapest on Monday of this week to speak with Hungarian PM Viktor Orbán? According to the government in Budapest and the State company responsible for the pipelines, FGSZ, the step was taken due to the rise in domestic demand for gas. Satisfying Hungarian demand has priority. Yeah, right. Like the rest of us Europeans, Hungary has been enjoying the usual global warming-induced prolonged summer September weather, with temperatures dipping below 15ºC (59ºF) only at night. Demand for gas there – for heating – is due to rise maybe end November, beginning December, and not particularly now. The real story here can be clearly seen from a couple weeks ago, when Gazprom similarly forced Poland to stop the “reverse supplies” of natural gas it was providing to the Ukraine by threatening to cut off the Poles’ supply they were diverting from. It’s just that the latter were willing to be rather more straightforward about what was happening than the Hungarians. Indeed, this Telegraaf piece speaks of a €10 billion Russian loan Orbán’s government is hoping to gain. How is such a thing even possible after the EU has collectively imposed repeated waves of sanctions – including of the financial kind – on Russia? Major: Putin really likes throwing Russia’s geopolitical weight around using the threat of energy cut-offs. I believe I read somewhere that the dissertation he wrote for whatever higher academic degree it was that he earned back in his KGB schooldays had precisely to do with that subject.The prevailing wisdom seems to be that, while the Ukraine has of course already been shoved out into the cold (literally) for the coming winter when it comes to Russian natural gas, Putin would not dare to do that to the rest of the EU because of the revenue loss that would entail. Then again, he seemed indifferent enough to the food-price inflation the Russian people have had to suffer resulting from his embargo on EU agricultural imports. Make no mistake: this coming winter is when the EU will be confronted in the bleakest and most direct way possible with the problem of how to do without Russian energy supplies. Minor: Notice here as well the common thread of the involvement of Gazprom, which is supposed to be a private company. Well, at least it is a private company to the likes of FIFA, which allows it to pay the mega-price to be one of the commercial sponsors of the Champions League. (It is also the shirt-sponsor of the famous German football club Schalke 04.) Inevitably, those watching Champions League games at home have to put up with repeated commercials extolling Gazprom as a reliable energy-provider; if you watch closely, you’ll even notice how the characteristic Champions League graphic used when heading into and out of commercial breaks, in which spotlights come on in turn around a circular stadium, precisely recalls the pattern of gas-jets lighting up on a stove! How many of those looking on for the football actually realize that Gazprom will be glad to let them freeze next winter, if only Putin gives the order? Take a look at the latest word issuing from Voice of Russia, the international radio broadcasting “service,” and associated website, of the Russian government. Hubert Orzechowski of the Polish edition of Newsweek first picked this up. Translation: “Russian radio: Poles in Zhitomir want autonomy, and Warsaw pushes for the break-up of Ukraine.” Zhitomir is a province of Western Ukraine, with a lot of ethnic Poles in it (although, interestingly, it’s not one of the two Ukrainian provinces that actually abut Poland itself). Ethnic Poles living in Ukraine demand a referendum in the Zhitomir Region to create a Polish autonomy with broad self-governance rights. They also insist that the Polish language be granted the official status along with the Ukrainian language. Just be aware that it’s all a crock. That’s the point of Orzechowski’s Newsweek piece. Yes, parts of Western Ukraine are what used to be Poland, before World War II; yes, there was considerable tension between Poles and Ukrainians over those lands – even leading to infamous massacres – in the 1930s and 40s. But for Poland a lot of water has passed under the bridge since that era, a lot of changes-of-regime, plenty of time for a change of attitude. Further, there has been no indication of this sort of alleged unrest among ethnic Polish citizens of Ukraine other than that cited in Voice of Russia’s fevered imaginings. These days the Polish government acknowledges its special relationship with Ukraine in more positive ways, such as actively supporting its eventual EU membership, as well as having taken the lead (along with Germany, in fact) in EU diplomacy towards Ukraine and Russia back when the Maidan Square crisis was at its height the first couple months of this year. This leading Polish role is not so much the case anymore, probably because NATO is becoming a more important forum for Europe to confront these increasingly alarming developments to the East. So the propaganda purpose of this sort of article is self-evident. As Orzechowski says at the end of his own commentary, “you can’t help feeling that this description fits perfectly yet another neighbor of Kiev’s”; one doesn’t know whether to mock Voice of Russia for its lack of imagination, or to admire it for its audacity, in trying to project onto Poland the very same irredentist trick its sponsor government is itself trying to pull in Eastern Ukraine. * But do let me give credit to Voice of Russia’s English-language writers where it is due: they actually nail the subjunctive there (“. . . insist that the Polish language be granted . . .”), something far beyond, say, at least 75% of English native speakers. One side-detail of the tragic plane-crash on Saturday that killed Polish President Lech Kaczynski along with much of that country’s political, military, and even financial elite was that the reason all these worthies were headed to a Russian provicincial backwater like Smolensk in the first place was to participate in a very solemn ceremony there. That was to have commemorated the mass-execution, which began exactly seventy years ago, of around 20,000 Polish officers and other prominent citizens by the Soviet secret police, who had had them fall into their hands as a result of the USSR’s invasion of Poland (coordinated with Hitler’s Germany) in September, 1939. This prompted some commentators to write ponderously of a doom-laden Katyn parallel: Poland’s intelligentsia wiped out there in 1940, and then once again in 2010. Unfortunately, these grim events are now totally obscuring the remarkable progress represented by the very fact that such a delegation of eminent Poles, headed by the President, was being allowed to go there in the first place – and by the no-less remarkable fact that Russian premier Vladimir Putin and his Polish counterpart Donald Tusk had in fact participated in a commemoration ceremony there just last Wednesday. 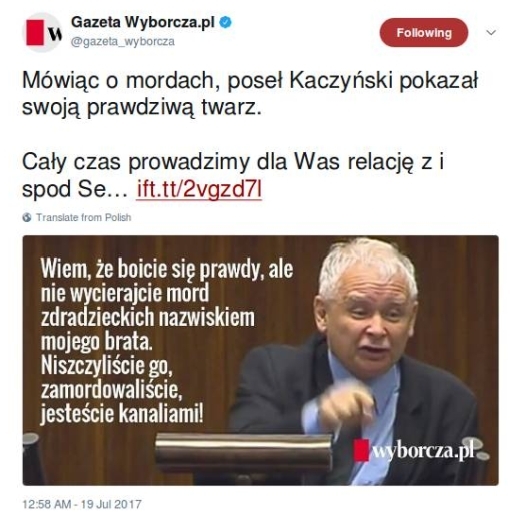 Looking back now at news coverage of these developments – that is, written before this past weekend’s tragedy – produces a very bittersweet feeling, especially from two articles on the Katyn legacy from among the elite of the German press, here the Süddeutsche Zeitung and Die Welt. In particular, the latter piece begins with the sentence “Seldom has the Polish public looked at Russia with so much hope as in these days” – on a webpage where, at the very same time, you can click over on the right-hand side (under “Current Videos”) to see a news-film of rescuers searching through the crash-site in the Russian forest! The Germans Are Coming – Back! As everyone knows very well, Polish membership in the EU is now a full month old. So it would seem to be an idle exercise in frustration to go back and review the various crazies who were agitating against that up till the very end: the small-time farmers afraid of being displaced in the market by Western European producers who are both more efficient and more generously supported by funds from the EU’s Common Agriculture Policy; those die-hard anti-German paranoiacs who were convinced that, right after the fireworks had died down, the descendants and representatives of those who had been driven out of what were once German but are now Polish lands would be back demanding their property back. For many people around the world, mainly either those actively wanting to or at least thinking about traveling to the United States, the big event marking this past first-business-week of the New Year was the introduction last Monday at America’s seaports and airports of mandatory procedures involving the photographing and fingerprinting of most foreign entrants. In one sense, this was just the sequel to the “air marshal” flap happening just before, as yet one more unilateral demand placed by the Bush administration on travel to the US, placed out there for other involved countries to “take it or leave it,” although resistance to this so far has been less than to the demand for air marshalls. However, see this NYT article for the great Brazilian exception, where authorities – spurred by a judge’s ruling – have in turn instituted the requirement that all Americans entering Brazil be photographed and fingerprinted. And that’s all Americans – the article makes mention that even American diplomats, plus visiting US Senator Pat Roberts, were required to deliver up mugshots and prints – and a better solution is hard to imagine for the obvious problem here that the high-and-mighty setting such US policy normally get to remain blissfully unaware of the impact their decisions have on the everyday lives of ordinarily mortals. There just remains the task of getting George W. Bush to pose in an airport somewhere, which would have the collateral benefit of greatly assisting those many hundreds of thousands of anti-US-policy protesters in Western Europe whose own attempts at fashioning a Bush mugshot on the posters and placards they march with in the streets have too often been hopelessly amateurish.